In my review of the second film, Beneath the Planet of the Apes, I mentioned that it had one of the worst endings I’ve ever seen in a film. Let me recap and spoil the second film for you now. So it’s pretty simple, the second followed the first. There wasn’t a lot you cared about, but Charlton Heston. His main goal is to stop an atomic bomb from detonating. In the end, all of the main characters die violent deaths, and Charlton Heston himself detonates the bomb, blowing earth to smithereens anyways. Whatever was actually good about the film was made pointless by the end. Everything you cared about. Gone. Kind of like Game of Thrones if you think about it. 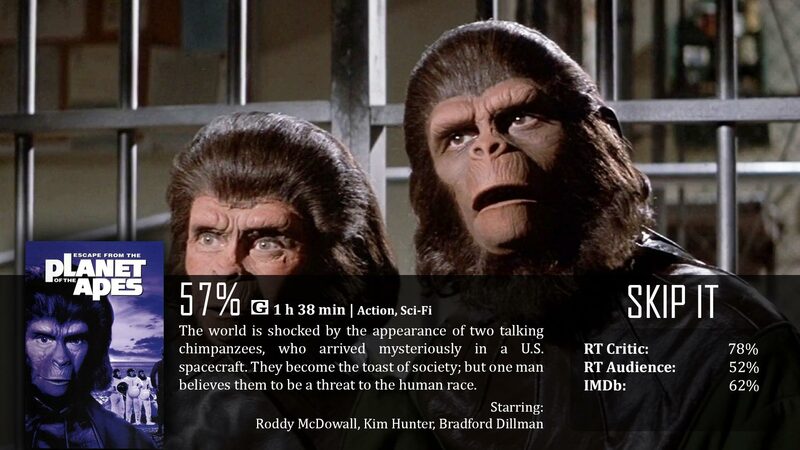 Anyway, I naturally didn’t know how they would make a third film if the “planet” of the apes was literally destroyed, along with all the apes…well they made a sequel, called it Escape from the Planet of the Apes and called it a day. As the title suggests, there was an escape from the planet of the apes. The escapees in question were actually Zira and her husband Cornelius – these two have been in all three films so far. How do I explain this? They somehow single-handedly pulled Charlton Heston’s spaceship out of the river and managed to actually fly it – before the world was destroyed, then after they got it to fly, they somehow sent it back into the past, because they actually land in “modern day” earth. Think the opposite of the first film. This is more – Planet of the Humans than anything else. I’m not going to lie, the concept of this film is both fascinating and brilliant at the same time. The construction and execution of the concept, on the other hand, was flawed. Basically, they had a really good idea, but what to do with that idea didn’t seem to go very far. I like the idea of changing it up and having the apes come to earth instead. I like the idea of seeing it from our perspective as a nice contrast. I most certainly like the idea that they could have possibly been the ones responsible for starting the next evolutionary chain as a time travel-type thing…but these are all simply ideas, and they weren’t coordinated properly. So they travelled back in time. It doesn’t make a lot of sense, but I accept it. The explanation they gave made no sense at all – and instead should have been about space travel slowing down time to the point of reversing it through the speed of sound. Make it centered on scientific terms, nerds love that. But no. Also, it needed more of a plot. You remove us from the dystopian setting, you’re going to have to replace it with something else, like a clear goal. These monkeys just land on earth and just walk around like they own the place with no distinction of what they are planning to do. They are basically the government’s play thing just because. Like all the other Planet of the Apes movies thus far, I feel like I could have done it better, and maybe that’s because they are older and are done differently, but overall I just felt like this film was simply too light-toned. They were never really dark, but the ideas that they planted in your head were. That’s how they did it back then, see? But Escape from the Planet of the Earth just didn’t have that either…I’m so torn. It’s definitely better than the second film, but that’s not saying much. The whole concept on its own is rather brilliant, and it actually focuses on different morals like racism and civil rights which is cool, but I think people are mostly just watching it because it has a pretty good concept. It just wasn’t presented very well. Having them come to earth is a nice touch, but back in the early ‘70s, earth just isn’t a scary place. Part of the first two films is that the planet alone is a desolate place. The planet was actually a character. Now, it is just a setting and it feels really wrong. It’s a cool idea…but unfortunately there wasn’t much they could really do. It’s not really their fault. Dr. Zira: We are peaceful creatures. We are happy to be here. May we be unchained?